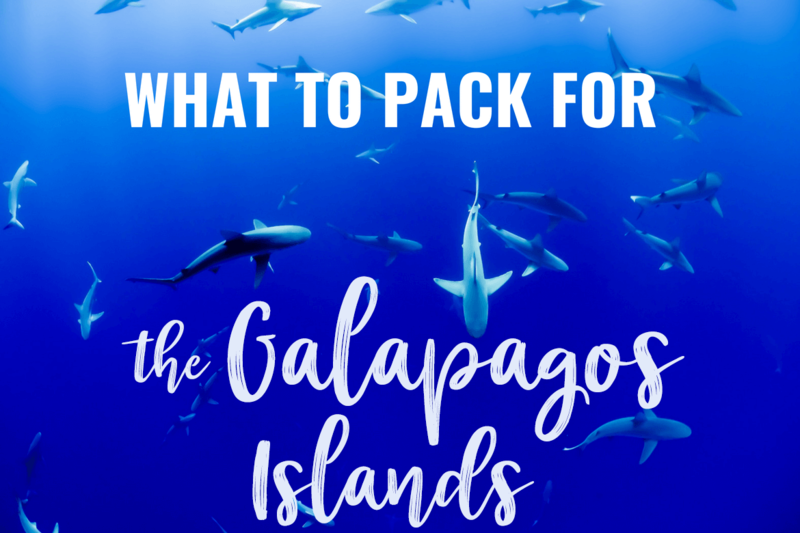 Whether you are taking a cruise or exploring the Galapagos Islands by land, you should start packing at least a few days in advance. The more well-prepared you are for your trip, the better your experience in the Galapagos will be. Due to its location near the equator, the Galápagos Islands has a subtropical climate. Most days are hot and sunny, especially from March to May. However, the water can be cool or even chilly, particularly from June to December. Daypack: During day tours you will need a lightweight backpack to carry your camera equipment, sunscreen, clothes and water. Packing cubes: Using packing cubes makes my suitcase look so much neater! Suitcase: If you are going on a cruise, there may be size restrictions for luggage as cabins are small. If you are exploring the Galapagos Islands by land and taking ferries, there are no size restrictions for baggage. However, your luggage will be transferred from water taxi to ferry, ferry to water taxi and to the dock, so it is still better not to bring a huge heavy suitcase. Walking shoes: You will need good sneakers or walking shoes for exploring the islands. Keens sandals can be worn both on land and in the water, making them perfect for wet landings where you step off the panga and wade to the beach. They are available for both Men and Women. Flip-flops: For wearing on the beach or around town. Socks: Bring plenty of socks, especially the sports type that can dry easily. You will be sweating and getting wet a lot so having fresh socks to change into will make you feel more comfortable! Short-sleeved shirts: As the temperature gets quite hot during the day, bring several lightweight T-shirts. Long-sleeved shirts: Bring a couple of long-sleeved shirts to wear in the evenings or on boat rides when it is windy. Evening Outfits: for dinner or dancing. As style in the Galapagos is more casual and laid-back, you don’t need to bring anything too fancy. For women, a dress or blouse with a skirt would be perfect for dinner in a nice restaurant. Men can bring a short-sleeved dress shirt and pants. Bottoms: A few pairs of shorts and lightweight pants. Raincoat: A light jacket or raincoat will keep you warm during boat rides and in the evenings as well as protect you from the sun. I have a Columbia jacket. Although snorkel gear is usually included on cruises and day trips, I recommend bringing your own mask and snorkel so that you will feel more comfortable. Cressi is a good brand. Sunblock: Since the Galapagos Islands are so close to the equator, the sun is extremely strong. You can easily get a terrible sunburn within minutes. Bring plenty of sunblock and try it out before your trip to make sure you aren’t allergic to it. Your sunblock should be water resistant if you are going swimming or snorkeling. Make sure to buy sunblock that is SPF 50+ or higher, especially if you have pale skin. SunBum is a reliable brand. Hat: A wide-brimmed hat will protect your hair and face from the sun. Without a hat, your scalp can get burnt and start flaking. It’s no fun looking like you have terrible dandruff, so definitely wear a hat! Tour guides like to wear a hat with a chin strap to prevent the wind from blowing it away. Some tour guides (mostly men) wear a hat that covers their neck. Sunglasses: Sunglasses are a must for your trip to the Galapagos Islands. Try to bring polarized sunglasses as they protect against glare, especially when you are looking at the water. If you are going paddle-boarding or kayaking, sunglasses that have the ability to float will prevent you from losing them if they fall off! Rash Guard: Rash guards are waterproof shirts that you can wear for water-based activities like snorkeling, swimming or paddle-boarding instead of a wetsuit. They also provide UV sun protection. Neck Scarf: Many boat crew members and tour guides wear bandanas/scarves around their necks and mouths to protect their skin from the sun. Tourists can too! Memory cards: The Galapagos offers many wonderful photo opportunities, so remember to bring enough memory cards to store all your photos and videos. A 64GB memory card has plenty of storage and is great for recording videos. Camera: A DSLR camera would be best for taking high-quality shots of the wildlife. I have been using the Canon EOS Rebel T6i for a few years and I am very happy with it. It has built-in wifi so you can easily transfer your photos to your phone using an app. If you prefer a more lightweight camera, the Canon PowerShot SX720 takes excellent quality shots and can still fit easily in your pocket! GoPro: a waterproof camera that is perfect for taking photos and videos while snorkeling. I have the GoPro Hero 6. The best GoPro accessory for snorkeling is the GoPro Bobber. There is a strap that you can wrap around your wrist, but in case you drop it, it will rise to the surface and float. Adapter: If you are visiting the Galapagos from the US or Canada, you can still use the same plugs. But if you are coming from Europe, for example, you will need to use an adapter. Here is a Universal Adapter that is compatible with different plugs all over the world. Power Bank: If you will be out all day and using your phone a lot to take photos and videos, a power bank will ensure your phone doesn’t run out of battery! Dry bag: Sometimes you may get splashed during panga rides, so putting your camera and valuables in a dry bag is a good idea. Microfiber Towel: Although cruise ships and day tour operators provide towels, if you are going to the beach on your own, a quick-drying microfiber towel will be useful. Binoculars: In the Galapagos Islands, the wildlife have no or little fear of humans, so you can see most of them up close. However, binoculars can come in very handy for birdwatching from a boat, or for spotting elusive birds on land like the Galapagos Hawk. Insect repellant: Big flies, wasps and mosquitoes may bother you in some parts of the islands, so bring along some insect repellant. I use Ben’s insect repellant, which has 30% DEET. Water bottle: As it can get hot during the day in the Galapagos and you will be walking and sweating a lot, water is essential! Consider bringing your own reusable water bottle to be more environmentally friendly. Anti-seasickness pills: You will likely experience rough seas at some point during your trip, especially if you take ferry speedboats between the islands. Bring anti-nausea pills and take them before any boat rides. The Moon Galapagos Islands Guidebook by Lisa Cho covers accommodations, food and tips for the four inhabited islands as well as detailed descriptions and photos of the uninhabited islands. There is also information about the two gateway cities, Quito and Guayaquil. The book is lightweight, making it convenient to carry around during your trip. This folding pocket guide to the most common animals in the Galapagos has beautiful illustrations. It’s great for identifying fish and birds! If you want a more detailed wildlife guide with photos and maps, Wildlife of the Galapagos is the best resource. Although your tour guides will be able to speak English with you, many boat crew members, taxi drivers and restaurant staff speak very little English. Learning some basic phrases in Spanish will greatly enhance your experience in the Galapagos! I like this pocket Latin American Spanish phrasebook. Disclosure: Some of the links above are affiliate links. This means if you make a purchase through one of the links in this post I will earn a small commission at NO additional cost to you. Thanks for this helpful post! I’ve always wanted to visit the Galapagos islands so if I ever got the chance to go I would certainly invest in the right equipment.